Note: This page describes how to implement the booking server with API v2. See Implement the booking server for instructions to use with the latest version. Setting up a Booking server on your end will allow Reserve with Google to create appointments / bookings / reservations with you on behalf of the user. Please note: all new partners should use REST API interface rather than gRPC API. Implement an API interface based on gRPC. This allows Google to send booking requests. The API surface is defined using gRPC's protobuf based IDL. We ask our new partners to implement a recommended set of API v2. Partners may select whichever URL and PORT works best for their infrastructure. This section introduces a recommended set of API v2. It applies to partners who have not implemented API v0. For our current partners that have implemented API v0, please contact Reserve with Google to learn more. Download the service definition in proto format below to get started with the API implementation. When creating a booking, Google will send the partner the user's given name, surname, phone number, and email. This should be treated as a guest checkout from the partner's point of view as Reserve with Google has no way to look up the user's account in the partner's system. The final booking should be shown to the partner's merchants in their system just like bookings that come for the partner's booking system. To get started, we provide a skeleton gRPC server in Java that can be compiled and installed. Check it out under Samples > gRPC Reference Implementation section. This server has stubbed out gRPC methods that are needed to support the integration, including authentication and health service. 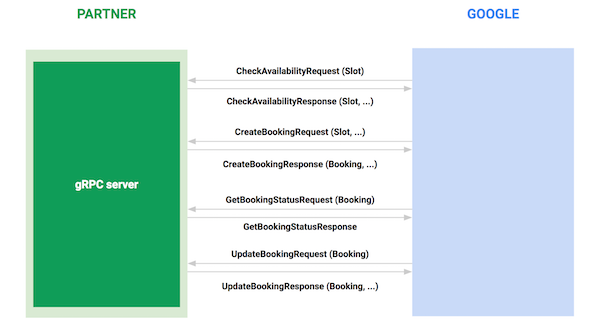 Two types of errors may occur when a partner backend handles gRPC requests: unexpected errors that arise from incorrect data; and business logic errors that indicate inability of creating or updating a booking (see Booking Failure), e.g., if the requested slot is unavailable. INVALID_ARGUMENT is used in RPCs such as CheckAvailability and CreateLease, and should be returned if the provided slot contains invalid information. NOT_FOUND is used in RPCs such as CreateBooking and ListBookings, and should be returned if the provided identifier is unknown to the partner. See reference of each method for its canonical gRPC error codes or see the full status code list. SLOT_UNAVAILABLE is used if the requested slot is not longer available. Communication over the network is not always reliable and Google Reserve may retry RPCs if no response is received. For this reason, all RPCs that mutate state (CreateBooking, UpdateBooking) have to be idempotent. Request messages for these RPCs include idempotency tokens to uniquely identify the request and allow the partner to distinguish between a retried RPC (with the intent to create a single booking) and two separate bookings. A successful CreateBooking RPC response includes the created booking and, in some cases, payment is processed as part of the booking flow. If the exact same CreateBookingRequest is received a second time (including idempotency_token), then the same CreateBookingResponse has to be returned. No second booking is created and the user, if applicable, is charged exactly once. Note that if a CreateBooking attempt fails, the partner backend should retry if the same request is sent again. Idempotency requirement applies to all methods that contain idempotency tokens. Calls from Reserve with Google to your backend need to be secured using SSL/TLS with certificate-based, mutual client/server authentication. This requires the use of a valid server certificate for your gRPC implementation and accepting a valid client certificate. Server certificate: the partner server has to be equipped with a valid server certificate associated with the domain name of the server (refer to this list of accepted root CAs). GRPC server implementations expect to serve a certificate chain that leads up to the root certificate. The easiest way to accomplish this is by appending the intermediate certificate(s) provided by the partner's web host in PEM format to the server certificate (also in PEM format). Note: Certificates have an expiration date. It is the partner's responsibility to be sure their certificate gets updated before it expires to avoid any service outage with Reserve with Google. Connection attempts without this client certificate should be rejected by the partner server. To validate the client certificate, the server relies on a set of trusted client root certificates. You can choose to obtain this set of trusted roots from an authority like Mozilla or install the set of roots currently recommended by the Google Internet Authority G2. In both cases, you may have to manually update the root certificates at times. Implement the GRPC Health Checking Protocol. This protocol enables Google to monitor the backend status of your gRPC implementation. The service specification is part of the GRPC distribution. Following the GRPC naming convention, the name of the service in the health check calls is ext.maps.booking.partner.v2.BookingService for API v2, or ext.maps.booking.partner.v0.BookingService for API v0. The health check should run on the same URL and PORT as the other endpoints. Note: Check out the reference implementations in Ruby.